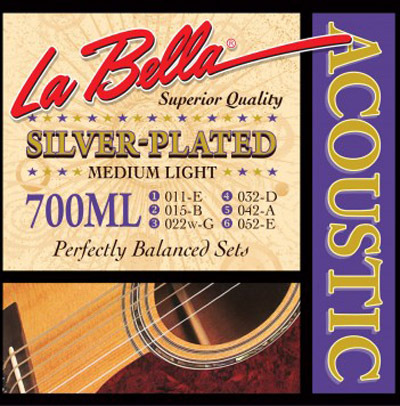 Silver-plated copper wire is the key to the 700ML acoustic strings from La Bella. The wire, which is hand wound on a steel core, produces a clean, crisp tone. The medium-light tension strings have slightly less tension than strings wound with bronze or brass. La Bella introduced this traditional style of string in the 1940s. I've been through a lot of different strings looking for a good balance and balanced highs and lows...less tension to boot. These strings are definitely tops for my larrivee om. Very very surprised they are not more recognized in the top recommendations. I play fingerstyle and easy strumming.